We were out checking yet another one of our proposed walk leaflet routes – this time right up towards the west end of the parish of Muker. Haymaking and raising dairy cows must have been a tough business this high up, but the evidence for lead mining and processing showed us how many of the smaller farms got by with one or members of a family off working in Keldside smelt mill or down the mines themselves. We have a probably nineteenth century map of a small farm called Smithy Holme which we took along to see if we could spot the various cowhouses marked in the fields around it. The land is no longer farmed from Smithy Holme itself but the house is clearly well-looked after with a magnificent home cowhouse which is almost as big as the house itself. On the way back we spotted yet another cowhouse from the map – now just a ruin, placed in a meadow with the unusual name of Quey Holme. Spot the ruin on the skyline in the photo and also the fine limekiln below – an essential part of the process of turning such marginal land into productive haymeadow. Our researcher Sue has just found a little booklet about farming in Upper Swaledale in the late 1940s. From ‘Farm Life in a Yorkshire Dale. An Economic Study of Swaledale’ (1948) by W H Long & G M Davies. Exploring the interiors of cowhouses is not recommended without the owners’ permission. It can also be a bit hazardous given how little light there is inside. There are also a LOT of cobwebs and the occasional dead bird or sheep so it can sometimes be a bit creepy. Imagine visiting these buildings at night with only a candle in a lantern to light your way? Some cowhouses have little niches where a lamp or lantern could be placed. In others you might see a hook for hanging a lantern from like this one. We interviewed a group of women who grew up on farms around Muker parish, they have clear memories of how dark the cowhouses were. Having found some great evidence for earlier structures inside Willy Greens cowhouse we then moved on to a fascinating little cowhouse called Jordan Close near Angram. Again, with permission of the owner we unknotted what seemed like two metres of baler twine and pushed open the door into the cow byre. Almost immediately we spotted another reused cruck timber with a joint and carpenters marks on the underside of the door lintel. Spot the ancient box of matches shoved into the joint – we found a hook for hanging a paraffin lamp or horn lantern from just inside the door. We then entered the byre area which has its original wooden boskins with a stone divider and hayracks. There was even a chain and rope remaining still attached to one of the rudsters where a cow would have been tied. We finally crawled through the skelbuse into the haymew and looking up were greeted by the magnificent sight of a series of split, reused oak cruck blades in the roof forming parts of the triangular trusses. One even still had carpenters marks on it. We now have to ask ourselves the same questions that we did when we explored Willy Greens cowhouse. Was there a timber cruck-built cowhouse here when it changed hands in 1688 as recorded in the Manorial Court Books, replaced at a later date but reusing some of the timber; or was the current stone cowhouse built pre-1688 using timber in its roof from a demolished cruck house nearby? One of the questions we are hoping to answer during the project is when the first cowhouses appeared in Upper Swaledale. We’ve already found written evidence for cowhouses built in meadows from 1686 to 1701 in the Muker & Healaugh Manorial Court Books . Yesterday we went out with Sue Wrathmell, our historic building specialist for the project and with the kind permission of the owners explored two of the earliest cowhouses that we found in those Court Books, Willy Greens and Jordan Close. It was therefore fascinating to go inside the building and see how the Hutchinsons had made improvements to the milking area, concrete boskins, whitewashed walls and the baulks above boarded out. The building itself seemed to fit the mid-eighteenth date given in our Historic Environment Record, the evidence for a raised roof mentioned in the original survey is probably evidence of a replacement roof being added at some point later in its life, and not a sign that there was an earlier thatched roof. The building sits on a massive stone plinth which might be evidence for an earlier cowhouse on the site (the one recorded in the Court Book dates to 1696). However, even more interesting was the piece of timber used as a lintel over the forking hole. With the use of a strong torch we discovered that it had a joint cut into it and even more exciting, it had carpenter’s marks. This means that it was a piece of wood reused from a much older timber-framed building, probably medieval or Tudor, a time when timber was plentiful and people were able to use huge pieces to construct buildings with. The timber frame was assembled off site, marked up, disassembled, taken onto the building site and reassembled using the marks as a guide. The question is, did this timber come from the cowhouse recorded as being there in 1696, a timber-framed one, which was then demolished and rebuilt in its current stone form during the eighteenth century? Or is the building we see today actually late seventeenth century and built using timber parts from a much older house nearby? The seventeenth century is known as the period of the Great Rebuild – all over the Yorkshire Dales timber cruck-framed houses were torn down and rebuilt in stone. The timber from the cruck-frames was often reused in the roofs of these houses, by that time big bits of timber were too precious to be simply discarded. A few of our volunteers recently attended a workshop in surveying traditional farm buildings. 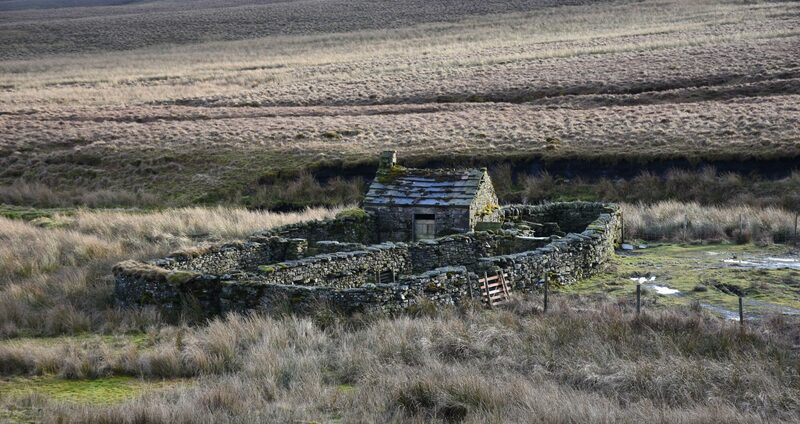 Being able to survey and record the field barns in Swaledale is integral in being able to protect the barns (and other traditional farm buildings) that make the area one of the largest conservation areas in the country! The volunteers were lucky enough to be learning about traditional farm buildings from expert, Robert White, who is also YDNPA’s previous Senior Historic Environment Officer. This workshop taught skills in recording, measuring and describing historic farm buildings which they can then use to survey barns independently. The information that they collect will then be submitted to our Historic Environment Record so that the condition of the buildings can be monitored over time. Another two-day surveying workshop is being held at Keld Resource Centre the weekend of 20th and 21st of May and we still have a couple of places left. If you would like to come along please email either rebecca.cadbury-simmons@yorkshiredales.org.uk or miles.johnson@yorkshiredales.org.uk. Our intrepid Dales Volunteers have now completed the task of assessing the six walk routes we have chosen to showcase the Muker area’s amazing cowhouse heritage. They have highlighted some of the issues that ranger Michael will be fixing with funding from the project and also made careful photographic records of all the cowhouses of interest along each of the routes – far too many to post here but we thought we’d share a few of the highlights. We’ll leave you to try and guess where they are! Swaledale was looking particularly gorgeous last week when we set off to visit some of the businesses working with us on the project. We distributed promotional materials about this blog and also handed over the new Cow’us Code beer mats to Keld Lodge and the Farmers Arms in Muker. Finally we had a chat with Usha Gap camp site about providing their campers with interpretation panels about the cowhouses on their farm. At a recent workshop volunteers learnt the merits of using digital photogrammetry to record traditional field barns (as well as other archaeological features). They had the opportunity to get out to a nearby field barn to have a go at photographing a barn themselves. Unfortunately the weather was changeable and the differing light levels made it difficult to get pictures without lots of contrast. However, with a bit of practice (and some editing) the product was a successful model of a local field barn (cow’us), Shot Lathe, near Keld.